Top 4 Reasons To Update Your Water Treatment Equipment - Does Your Equipment Need an Upgrade? When you purchase a water softener or treatment system for your North Florida home, you immediately begin to enjoy the benefits of clean and clear mineral-free water. These systems really are quite amazing – just continue to add salt and the system takes care of itself, right? The trouble is, how do you know if your water treatment equipment is still working properly? High quality systems could last a decade, but should you wait that long? Most of us purchase a new car before it breaks down, and we usually don’t keep our smartphones more than a couple years before we replace them. That’s usually because we want to take advantage of new technology, better features, and advancements that increase efficiency. The same is true for water softeners and water treatment equipment. Here are the top 4 reasons you should consider upgrading your home’s water treatment equipment. Today’s appliances are highly touted as “High Efficiency” which means they use less water and energy. These appliances require highly efficient water which is one reason water softeners have become more important than ever. Appliances that use water operate better and and last longer with soft water. Water softeners have also become more efficient. Our WaterCare® systems can be equipped with what we call Water Efficient Technology (W.E.T.) which goes beyond the benefits of our already highly efficient water softeners. 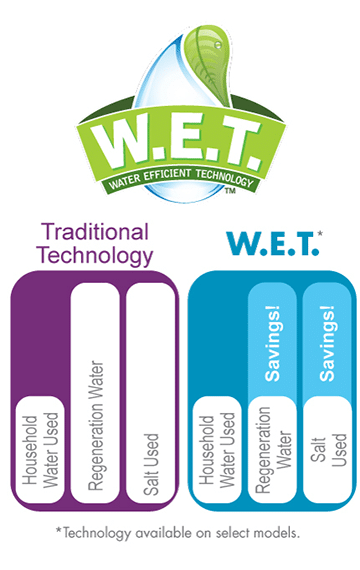 With W.E.T., the softener learns your home’s water usage and adjusts cycle times, ensuring that only the proper amount of salt and water that is absolutely necessary is used during regeneration. This technology helps you lower your utility bills and increase sustainability. Every home’s water quality is different and requires customized solutions to achieve desired results. The water treatment system installed years ago may not protect you from what’s in your water today. That’s why it’s important to have your water tested on a yearly basis – especially if your home uses well water. Our professionals can evaluate your home’s water quality and help you choose the right solutions for your water. We also have access to the most effective and exclusive filtration medias for well water applications. Municipal water quality has not frequently been a topic of discussion through the years but there is a growing awareness about how in-home treatment can solve problems and give families peace of mind. The crisis in Flint, Michigan and concerns of lead in drinking water due to aging city infrastructure, fluoride, pharmaceuticals, mircroplastics, and even agricultural runoff are now being discussed with some of our experts. The good news is our team can talk through these issues with you and point you towards solutions that ease your concerns. In many cases a reverse osmosis drinking water system will reduce or remove the majority of harmful contaminants, however the majority of our customers choose whole house systems installed. Does Your Jacksonville Water Softener or Water Treatment System Need an Upgrade? If you’re uncertain about how old your water softener is or whether it’s still effective, or if you recently moved into a new home and want to learn more about your water quality, please give us a call at 904-287-0003 or send a message through our Contact Form and one of our experts will get in touch with you soon.